Coprosma Marble Queen is a spreading shrub. The Marble Queen Mirror Plant grows to 4 feet tall and 6-8 feet wide. Mirror Plans prefer regular water but will carry on with far less once established. Plant Coprosma Marble Queen in full sun to light shade, Coprosma Marble Queen will require more shade the further inland the garden. Coprosma Marble Queen is grown for the foliage. Small white flowers are produced Spring into Summer. Coprosma Marble Queen will tolerate a wide variety of soil conditions. 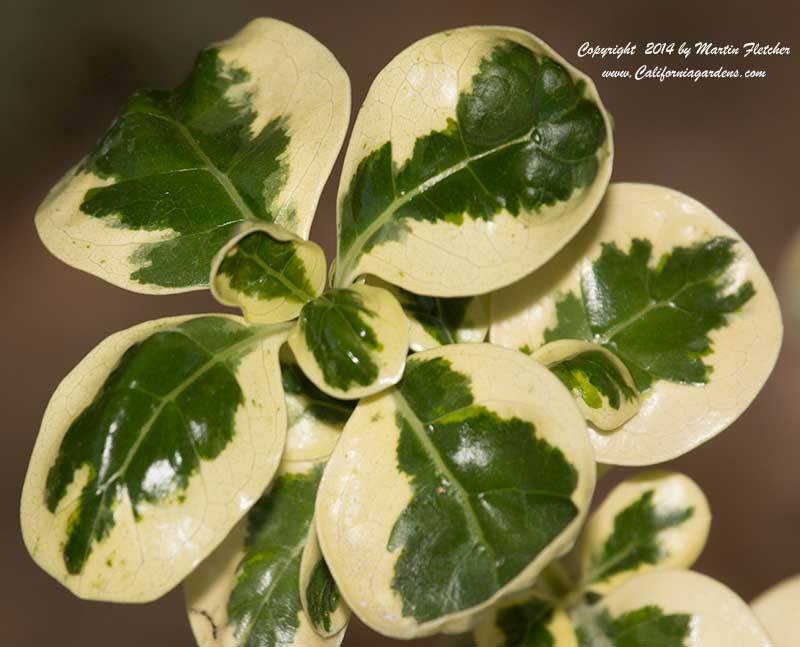 Marble Queen Mirror Plants are hardy into the low 20°'s F.
Flowers and foliage of Coprosma Marble Queen the Marble Queen Mirror Plant. High resolution photos are part of our garden image collection.